Roughly 750 million people watched Prince Charles tie the knot with Lady Diana Spencer in July 1981. Despite all the horse-drawn carriages and oversize dresses, the relationship didn't prove to be a fairy tale. By 1986, Charles had rekindled a romance with Camilla Parker Bowles, whom he had first met at a polo match in 1970 and whom Diana privately referred to as "the Rottweiler." In 1993, the tabloids leaked an intimate recording in which Charles told Camilla that he longed to be her tampon. 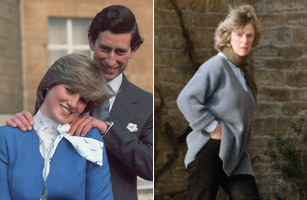 The royal couple separated and Diana publicly blamed Camilla for her relationship woes. "Well, there were three of us in this marriage, so it was a bit crowded," she said in a 1995 interview with the BBC. Charles and Diana formally divorced in 1996; Charles married Camilla in 2005.